Pastor Jeff was called to eternal salvation at age twenty-seven through the faithful witness of a close friend who invited him to Twin Cities Bible Church in Maplewood, Minnesota. That Sunday he heard the gospel preached clearly from the book of Galatians. The next week, while reading A. W. Pink’s essay on saving faith, he repented of his sin and trusted in Christ to save him. Everything began to change at that point in Jeff’s life. He began to develop a real, growing love for Jesus and His word, a desire for biblical teaching, and a passion for fellowship with believers. Furthermore, soon after his conversion, Jeff began to desire serving the Lord in ministry. Having brought this desire before the elders at Twin Cities Bible Church, Jeff began the process of confirming this call and training for ministry by teaching and serving the youth on Wednesday nights, teaching through the book of Colossians in adult Christian Education, and attending elders’ meetings. Through God’s providence, his family was led to Chicago for a period of time where he continued serving in college campus ministry and in a growing church plant. By God’s grace, in 2005, he was called back to Minnesota to help plant a church in Lakeville and to pursue formal seminary training. Jeff has been trained as a doctor of chiropractic with specialty in radiology and continues to use this education to help support his family. He earned a Masters of Divinity from Central Baptist Theological Seminary in May of 2012. He has also taken classes at Trinity Evangelical Divinity School and Moody Bible Institute. 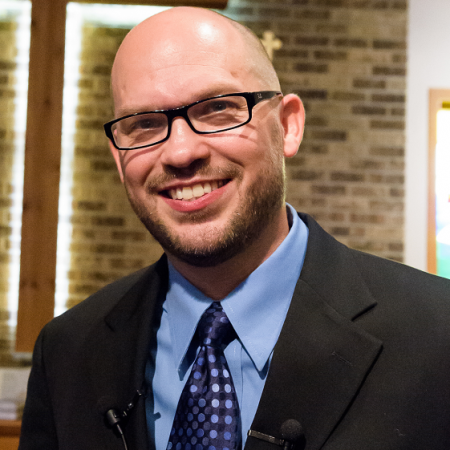 Once ordained in November of 2007, Jeff served as Assistant Pastor at Twin Cities Bible Church and has since become the Pastor of Preaching at Grace Community Bible Church since its inception in April of 2009. Jeff is passionate to teach followers of Jesus true biblical Christianity from the authoritative, inerrant, and sufficient word of God, with a literal, grammatical, and historical approach to the text of Scripture. Based on these convictions, he is committed to preach the meaning of the text in its context verse-by-verse from both the Old and New Testaments. In short, preaching Jesus Christ and Him crucified – preaching the gospel of Jesus Christ – is his lifetime calling and passion. Jeff has been married since 1995 to his beautiful wife Jodi and the Lord has blessed them with nine wonderful children. Jeff continues to work as a radiologist part time at Northwestern Health Sciences University. He enjoys sports, bonfires, the outdoors, playing with his children, as well as reading and discussing theology.